Buy me to give a friend a laugh! War doesn’t determine who is right only who is left. Now in common use the word is from an unknown author possibly 19th century, who mashed up the Greek for παρά (para, “against”) and προσδοκία (prosdokia, “expectation”). There is a lot of criticism of the words origins by purists and despite being in common use, it has not yet been added to a paper dictionary. If I agreed with them we’d all be wrong! The best paraprosdokians not only change the meaning of an early phrase, they also play on the double meaning of a particular word, creating a form of semantic zeugma or syllepsis like this one from Oscar Wilde. Oh, flowers are as common here, Miss Fairfax, as people are in London. Some paraprosdokians are based on well known aphorisms and are all the more pithy because of it. One thing that humbles me deeply is to see that human genius has its limits while human stupidity does not. Oscar Wilde said: "Some cause happiness wherever they go. Others, whenever they go." Before you criticize a man, walk a mile in his shoes. That way, you will be a mile away and he won’t have any shoes. 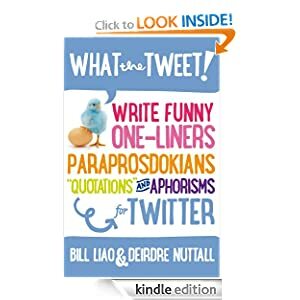 Laugh out loud at these carefully collected, witty, wise, fun and funny paraprosdokian sentences you can copy & share! It has been said that democracy is the worst form of government except all those other forms that have been tried. A problem is really only a fact that someone is resisting. There’s a bunch of different crunches that affect the abs … my favorite is Nestle’s. A woman’s place is in charge. Well my days of not taking you seriously are coming to a middle. Build it and they will complain. The most important social element in modern computer game development is probably still beer. I’m interested in nothing, with the right story I can make almost anything from it. I try to watch what I eat and yet my eyes just aren’t quick enough. She got her good looks from her father; he’s a plastic surgeon. Some people are like Slinkies not really good for anything, but you can’t help smiling when you see one tumble down the stairs. Two wrongs don’t make a right, three lefts do. Free and fair elections are the mainstay of modern democracy, the only downside is that after the votes are counted a politician wins. Some cause happiness wherever they go. Others, whenever they go. Two guys walked into a bar, the third one ducked. Womens rights impress me as much as their lefts. I didn’t say it was your fault; I said I was blaming you. The practice of mindfulness may show you whats so, further enlightenment will show you, so what. Humanity has achieved, abiding love, peace, progress, truth, beauty, glory, enlightenment and tolerance, on paper. They had lost the art of conversation but not, unfortunately, their powers of speach. If you’re telekinetic raise my hand. Pet spiders are cheaper to buy off the web. Speed up your smartphone, throw it out a 10th story window. A broken pencil is pointless. We can repair what your husband fixed. Newton stayed up all night puzzling the movement of the sun then it dawned on him. The car stopped on a dime, which unfortunately was in a pedestrian’s pocket. You are what you eat, may contains nuts. Where there’s a will there are relatives. I hate to say “I told you so” so I am going to shout it really loud. A bad banker quickly loses interest. Strong emotions are stupid and should be hated. A banker will always lend you an umbrella on a sunny day. Atheism is always not for prophet. The saying ‘Getting there is half the fun’ became obsolete with the advent of budget airlines. The light at the end of the tunnel is the headlamp of the train. If I am reading this graph correctly, I would be very surprised. Never leave till tomorrow what you can immediately forget. You’re not yourself today it’s nice. The crows seemed to be calling his name,’ thought Caw. Your argument is sound, just sound, lots of sound. One morning I shot an elephant in my pajamas. How he got in my pajamas I’ll never know. I sleep eight hours a day. And at least ten at night. Well, I’m having a great day. Woke up this morning, got out of bed, went to the bathroom. In that order! I can see your point, but I still think you’re full of BS. If the enemy is in range remember so are you. If you see a man running from a tiger run faster than he does, you can’t outrun the tiger and you really don’t have to. I had beautiful wives, every one beautiful, talented and now rich. I don’t know why they told me I’m innumerate, it doesn’t add up. I live in my own little world, they know me here. One thing you mustn’t miss when you visit Launceston is the plane. I don’t do drugs anymore, I get the same effect just standing up these days. I don’t approve of political jokes. I’ve seen too many of them get elected. Of course men can multitask, we read in the bathroom. Growing old is tough not growing old is worse. To keep fit my grandmother walks five miles a day, she’s 97 now and we have no idea where she is. Laughter is the best medicine, if you don’t have insurance. I miss my ex so often, I really need a laser sight. Clothes maketh the man, naked people have little or no influence at all. I can’t thank you enough, you’re never bloody happy are you? I used to be conceited, but now I’m perfect. To err is human, to really mess up though, that takes a computer. Experts know more and more about less and less till they know absolutely everything about nothing. Todays computers are so fast they can screw up a billion times a second. Nothing is possible, I’ve been doing it for years.